Plans to finance both public education and transit at the local level would be stopped in their tracks under HB 1224 that passed the state Senate Finance Committee yesterday. The bill not only places a hard cap on the local sales tax rate at 2.5 percent but also only allows counties to levy a sales tax increase for either education or transit—not both. This bill joins a slate of other bills that would restrict local control. The full Senate is scheduled to vote on the bill Monday night. In effect, the bill restricts local governments’ authority to meet local needs and balance their budgets. Importantly, the bill is aimed at shifting the responsibility of funding public education away from the state and towards local governments. The state clearly cannot afford last year’s tax plan and now legislators are proposing budgets that would make serious cuts to public education as a result. Those cuts would have to be absorbed by children in the classroom or addressed at the local level, putting local governments in a tough spot having to choose whether or not to make up the difference via a local tax. Local governments are dealing with the fallout from last year’s tax plan in other ways too. They no longer have access to the school Capital Building Fund, which received a portion of revenue generated from the state corporate income tax. Schools used this fund to help them meet their education obligations, as my colleague explained last month. The result is a $382 million dent over the next five years. This loss is on top of the looming $63 million-annual dent resulting from elimination of the local privilege tax in 2015. During the debate in the committee, proponents of HB 1224 claimed that this bill would “level the playing field.” The opposite is true, however. A level playing field is created when the state equitably supports schools so that smaller, low-wealth counties with a limited tax base are not limited in the quality of education or infrastructure that they can provide in their communities. Proponents of the bill have even said they would prefer local governments to choose education as the priority—not transit. It’s not much of a choice when state education budgets are inadequate year after year. The bill forces a false choice between the need to prioritize education or transit. The state’s communities are dynamic places that need both education and transit to be competitive, quality places to live. Voters should get to decide on what they want their tax dollars to support. They deserve a choice that’s not limited because of state legislators’ bad choices. Until a very slight funding expansion was approved last year, the public transportation budget was cut several years in a row. Lawmakers also just restructured the way that projects can compete for transportation dollars—and public transit is at a disadvantage because it can’t compete for all pots of state transportation money. For these reasons and many others, local governments find local financing options to support public transit compelling as well as those for education. Limiting the options for local governments should be rejected, especially in the face of inadequate state budgets—due to tax cuts—that put pressures on local budgets. State lawmakers should instead focus on creating a fair, stable, and adequate revenue stream that is able to fund core services and programs such as public education. Doing so means bringing back the state Earned Income Tax Credit—a factor that becomes increasingly important to meeting the tax fairness principle as local governments turn to regressive sale taxes to address the budget woes they’re facing. All counties stand to lose because this bill further restricts local authority by forcing a choice between education and transportation. Some counties stand to gain specific taxing authority in one aspect: the bill increases the transit levy authority from one-quarter percent to one-half percent for all counties—now, only the largest urban counties in the state can levy a one-half percent sales tax. Under the bill, all counties would also be able to levy a one-percent sales tax to support public education. Yet again, counties can only put those dollars either towards education or transit; so it’s a restricted expansion. For the counties who seek to raise a half-percent sales tax for education, the bill only allows them to vote in quarter-percent sales tax increments—this means two separate votes to get to a half-percent sales tax. This bill is particularly harsh for Mecklenburg, Forsyth, Guilford, and Wake counties because they are currently authorized to levy up to 2.75 percent under a pro-transit law passed in 2009. 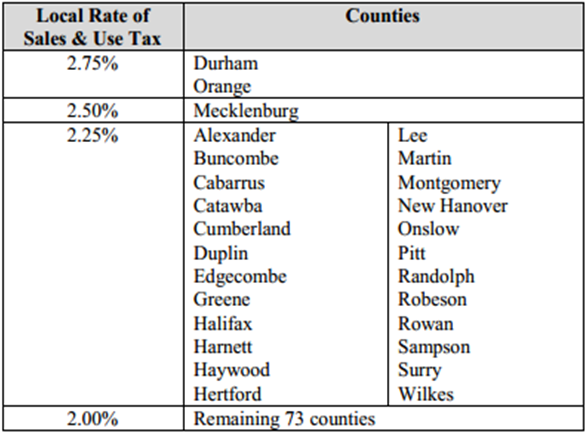 Durham and Orange already have a 2.75 percent sales tax in place and are thus grandfathered in—but they will lose that status if they ever repeal their transit tax. The bill could deal the quickest blow to Mecklenburg County, which is planning to ask their voters to support a quarter-percent sales tax increase for education this fall. It appears they could be prohibited from doing so under this bill because their local option tax rate is currently at the 2.5 percent cap (2 percent for general and one-half percent for transit). Yet, there are news reports that a cutoff date included in the bill may exempt the County from specific provision of the bill, effectively creating a loophole. Funny how these small government advocates want to control the ability of municipalities to govern themselves. More hypocritical lunacy from the NC GOTP. They are giving new meaning to over reaching. It appears a Tea Party mentality is holding our state captive. Give some people a title and they think they know what is best for the little people. At this rate I will no longer be a registered independent and will be voting a straight ticket due to the damage to my trust this cold hearted group has blindly inflicted. Well the choice is clear. Education over transit. If there is anything more of a black hole of funding than the government schools, it is government transportation. The choice is clear, vote the baggers out of office.